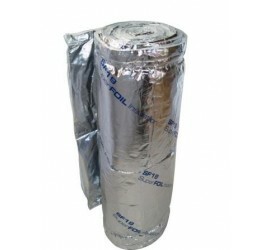 SuperFOIL SF19 is the UK’s best value multi-layer foil insulation. Consisting of 19 layers of reflective foil, with thermo foam separation layers. SF19 has radiant reflective properties, reflecting unwanted heat from solar gain in summer and enhancing insulation in winter. SF19 also has air barrier properties and can control air movement for further energy efficiencies. In situ energy assessment indicates that multilayer foils have benefits over traditional (non reflective) insulation. 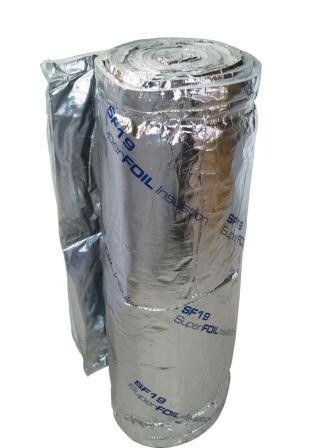 SuperFOIL SF19 is easier to handle, install, cut, and seal than any other form of building insulation, and lasts over 50 years with minimal loss of performance caused by dust, drafts, pests or osmosis. SF19 now also has LABC Registered System approval which helps to streamline Building regulation applications in turn helping to save time and money! Other similar brands are Actis Triso Super 10, TLX silver, Genex, Alumaflex, please check with our technical for clarification. Key product features •SF19 now has LABC registered system approval. •SF19 SuperFOIL has a BBA Certified R value of 2.13 in roofs & 2.59 in walls. •‘DUET’ Installation – An over and under the rafter application consisting of two layers of SuperFOIL. SF19 + SF40 provides a U-value of 0.18, meeting current UK building regulations. LABC system approval can also be found for the installation method. • ’COMBI’ Installation – Use with any other insulation, including mineral wool or Polyurethane board, to achieve the required insulation U-value. Fitting SF19 over existing insulation will extend the life of that insulation. •SF19 SuperFOIL is ideal for use in walls and roof structures in new build and in renovation, refurbishment / extension projects; •SF19′s technical specification means high performance from a small footprint. •SF19 SuperFOIL also acts as a radiant barrier to reflect exccessive heat gain during the summer months, as well as insulating throughout the year. •Easy installation results in minimal waste, together with the ability to recycle off cuts. Superfoil is manufactured with 40% recycled materials and is recyclable at the end of its useful life. •SF products are non hazardous and there are no special requirements for installation or disposal of waste. Multifoils have radiant Reflective properties, reflecting unwanted heat from solar gain in summer and enchancing insulation in winter. SF19 also has air barrier properties and can control air movement for further energy efficiencies. In situ energy assessment indicates that multilayer foils have benefits over traditional (non reflective) insulation.Other similar brands are Actis Triso Super 10, TLX silver, Genex, Alumaflex, please check with our technical for clarification.